Many homeowners only consider the aesthetics of window treatments from inside a room. But it’s also important to think about how the treatments look and function from the outside. Here at Treasure Coast Window Fashions in West Palm Beach, we’re happy to tell our customers that now there’s a way for homeowners to have a consistent look from the outside, even if they aren’t using the same treatments and colors in every room. Hunter Douglas has addressed this by creating products that have a common backing (either white or neutral) on window treatments, regardless of what they look like inside the house. Window treatments from Hunter Douglas that offer this feature include Duette® Honeycomb Shades, Silhouette® Window Shadings, Pirouette® Window Shadings, Luminette® Privacy Sheers, Vignette® Modern Roman Shades, and Provenance® Woven Wood Shades with Liner. Look at how your current window treatments are functioning. Are they performing the way you want or need them to? Are they energy-efficient? Do they add value to your home? Are they protecting your furniture and rugs from harmful UV rays? Do they filter or block light out at the appropriate times of day? Do they provide the right level of privacy? Window treatments don’t just add beauty at the window, they offer a multitude of features and benefits. Very often, we overlook functionality for fashion. In today’s market you can have both. 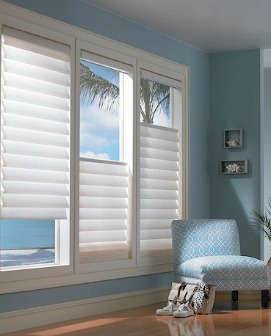 At Treasure Coast, we’ll help you consider the functionality and look of your window treatments from the outside in. When was the last time you looked at your home from the sidewalk or street—particularly at night? Do you know if your home is safe from “Peeping Toms”? Feeling safe and secure can be achieved in a number of different ways. Hunter Douglas, the leader in window fashions, takes security very seriously. They offer fabrics and materials in each of their product offerings that will provide you with the level of privacy you want. So, STOP “Peeping Toms” by selecting window treatments that not only provide beauty at the window but also provide you with maximum privacy to turn your house into a safe home.